The Root Cause Analysis Handbook along with its downloadable resources and RCA Map are the gold standard in root cause analysis (RCA) for both practitioners and students worldwide. It offers the unique breadth, depth, and practicality that can only come from six authors with a wellspring of 150+ years of combined consulting experience in the fields of risk/reliability engineering, risk management, incident investigation/root cause analysis, hazard analysis, process safety, environmental safety, loss prevention, asset integrity, and professional/ technical training. Based on real-world, globally successful, proprietary methodology by an international consulting firm with 50+ years’ experience in 35+ countries, serving a impressive array of industries, NGOs, and government agencies. You’ll find field-tested, easily adaptable methods to improve your own processes and get management buy-in. Practical 300-page download toolkit including examples of Cause and Effect Trees and sample template; examples of Cause and Effect Timelines and sample template; toolkits for Investigating, Data Gathering, Data Analysis, etc. ; plentiful forms, checklists, questionnaires, and sample plans; and a resource list of recommended books, websites, organizations, etc. Root Cause Map (full color wall chart 17″ x 22″), a powerful tool for staff to use in identifying and coding root causes. Licensed access to ABS Consulting website for an abundant collection of new/archival articles, examples, charts, forms, etc., as an ongoing way to stay abreast of the field. Chapter introductions/summaries; sample plans; examples of incidents drawn from many industries; five appendices packed with step-by-step instructions for conducting every phase of RCA; numerous charts, checklists, and reproducible forms; and a glossary all facilitate classroom use in college courses and professional development programs. This comprehensive, 600-page package (book + downloads + RCA 17″ x 22″ map + online resources) presents the field-tested SOURCE methodology, or Seeking Out the Underlying Causes of Events, from ABS Consulting, an international firm with 50+ years of experience in 35+ countries. This model customizes, combines, and encapsulates global best practices for investigating incidents following any loss, whether related to people, equipment, software, structural failure, or other factors. The methodology addresses (1) incident investigation and (2) corrective and preventive action requirements found in many regulations, industry standards, and guidance documents. The SOURCE system enables businesses to generate specific, concrete recommendations for preventing incident recurrences. Using the factual data of any incident, this model can help you implement more reliable and cost-effective practices that result in major, long-term improvements. Such process improvements increase your business’ ability to recover from and prevent incidents with financial, legal, health, and safety risks. Included are tips and tools for developing an ongoing incident investigation program and — importantly — successfully dealing with the resulting management, corporate culture, and process changes often required. The six authors use their collective global experience to guide you step-by-step through every phase of conducting a root cause analysis, including investigating, categorizing, reporting and trending, and ultimately eliminating the root causes of incidents with quality, reliability, environmental, health, safety, and production-process impacts. How to determine whether an incident has occurred, how to classify and categorize the incident, and how to decide whether to conduct an in-depth investigation. How to collect data related to people, processes, procedures, documents (both hard copy and electronic), position, and physical data associated with an incident. How to analyze incidents to determine causal factors using tools such as causal factor charts, timelines, and cause and effect trees. Guidance is also provided on identifying root causes using ABS Consulting’s Root Cause Map , which is also included as a convenient pull-out, color-coded, 17″ x22″ chart. How to document causal factors and root causes identified during an analysis, including how to identify what changes (i.e., recommendations) may be needed to enhance management systems and reduce risks. How to archive findings and recommendations to allow review and trending of incident patterns after some period of SOURCE use. Clarifies terms often used differently by different groups. (8 pages) describes each segment of the Root Cause Map and presents detailed descriptions of the individual nodes (or items) on the map. The Root Cause Map(tm) itself is included as part of the SOURCE Investigator’s Toolkit in Appendix F.
(51 pages) provides summary guidance and resources (such as checklists and forms) that can be used to document incident investigation activities. Root Cause Analysis Handbook is widely used in corporate training programs and college courses all over the world. If you’re responsible for quality, reliability, safety, and/or risk management, you’ll want this comprehensive and practical resource at your fingertips! 8.2 Why Be Careful When Selecting Incidents for Investigation? Contact Rothstein Associates, Inc. to request a complimentary copy to evaluate for classroom use. Below are links to PDFs of excerpts from chapters and appendices to provide a sense of the book content and style. Each is copyrighted and permission is granted to use this material for textbook adoption evaluation only. Root Cause Analysis Handbook has been peer reviewed and selected by the American Society for Quality (ASQ), Risk and Insurance Management Society (RIMS), and other professional associations for inclusion in their online bookstores. Root Cause Analysis Handbook is written by a team of six international consultants with a combined experience of nearly 150 years in the fields of risk/reliability engineering, risk management, incident investigation/root cause analysis, hazard analysis, process safety, environmental safety, loss prevention, asset integrity, and professional/technical training. They are all on the staff of ABS Consulting, a Houston-based firm specializing in global safety, risk, and integrity management for half a century and operating in over 35 countries. The company serves customers in the oil and gas, chemical, nuclear, maritime, renewable energy, mining, food processing, hospitality, and transportation industries as well as government agencies. LEE N. VANDEN HEUVEL is Manager of Incident Investigation/Root Cause Analysis Services and the Manager of Training Services for ABS Consulting, with 25+ years of experience in plant operations and analysis. He has assisted organizations in many different industries with the development and implementation of incident investigation and root cause analysis (RCA) programs. He has also led and participated in investigations in many types of industries, including chemical, refining, healthcare, manufacturing, drilling, machining, pharmaceuticals, waste disposal, nuclear power, and food processing. Vanden Heuvel was previously the project manager and lead analyst for a large quantitative risk assessment program at the Oak Ridge National Laboratory. He also worked for eight years at a nuclear power plant in operations, engineering support, and training. His current responsibilities are in the areas of RCAs, incident investigations, human factors, procedures, safety analyses, and economic/decision analyses. DONALD K. LORENZO is the Director of Training Services for ABS Consulting. He has 30+ years of experience in hazard analysis and risk assessment. He was previously a development engineer for Union Carbide Corporation. Mr. Lorenzo specializes in safety and environmental applications of ABS Consulting’s SOURCEâ„¢ methodology. He is a registered Professional Engineer in the state of Tennessee and a Certified Technical Trainer. WALTER E. HANSON is a Project Manager and Risk/Reliability Engineer for ABS Consulting. He has 25+ years of experience in developing, implementing, and managing loss prevention management systems, including mishap investigation, system safety, policy and procedure, training systems, performance measurement, and human factors. At ABS Consulting he works on various risk management projects for the United States Coast Guard and other transportation and maritime clients. He was a primary developer of ABS Consulting s Marine Root Cause Analysis Technique (MaRCAT). LAURA O. JACKSON is a Risk/Reliability Engineer for ABS Consulting. She has been involved in evaluating risks associated with corporate and governmental operations through the development and application of a number of methodologies, including relative risk ranking, risk matrices, enterprise risk management (ERM), project risk management, root cause analysis, and hazard and operability (HAZOP) analysis. She has served on teams that investigated incidents at a variety of commercial facilities, and she has performed comprehensive hazard assessments, including security risk, for the United States Coast Guard and the Department of Homeland Security. JAMES J. ROONEY is a Senior Risk/Reliability Engineer and Manager of Webinar Training Services for ABS Consulting. He has 25+ years of experience in quality engineering, reliability engineering, risk assessment, and process safety management. He is a Fellow of the American Society for Quality (ASQ), ASQ-certified HACCP auditor, Certified Quality Auditor, Certified Quality Engineer, Certified Quality Improvement Associate, Certified Quality Manager, Certified Reliability Engineer and registered Professional Engineer in the state of Tennessee. He specializes in quality and medical applications of the SOURCEâ„¢ methodology. DAVID A. WALKER has been working in the risk management, process safety, loss prevention, incident investigation/root cause analysis, system reliability, and asset integrity management fields for more than 20 years. He is Vice President of Public Sector for ABS Consulting. He is also an instructor for (1) ABS Consulting Training Services, (2) professional societies such as the American Society of Mechanical Engineers and the American Institute of Chemical Engineers Center for Chemical Process Safety, and (3) specialized centers at universities. Root Cause Analysis Handbook has been widely adopted for use in college courses and corporate professional development programs. The book itself and the accompanying free downloads contain many helpful tools that can be used for classroom instruction. 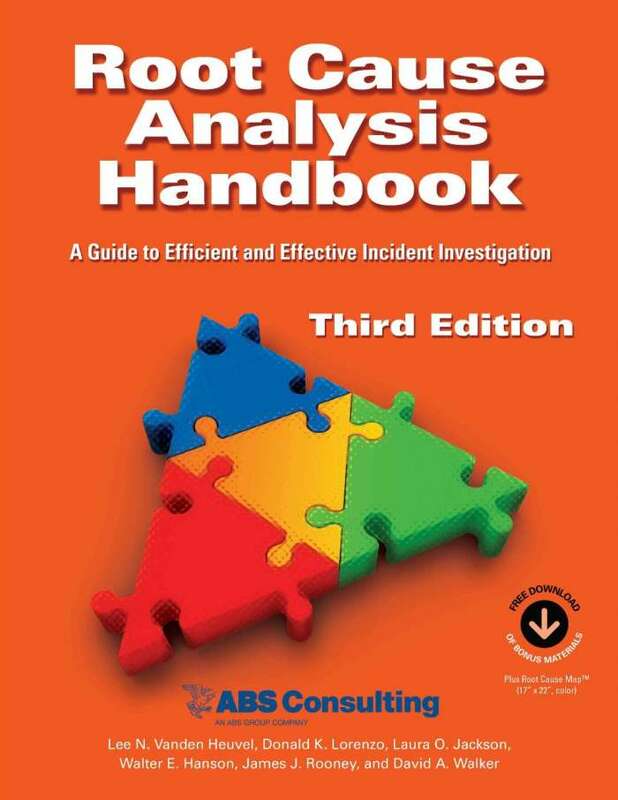 The book includes chapter introductions and summaries; sample plans; examples of incidents drawn from a wide variety of industries; five appendices packed with step-by-step instructions for conducting an incident investigation, writing reports and communicating about it, and implementing the recommendations; numerous charts, checklists, and reproducible forms; and a glossary. Wall size (17″ x 22″), color-coded flow chart illustrating all the key steps in the root cause analysis process. Toolkits for Investigating, Data Gathering, Data Analysis, etc. Resource list of recommended books, websites, organizations, etc. See the EXCERPTS Tab above and click on Section 11 for a complete list of ancillary resources available in the companion downloads and the ABS Consulting website. Note; these resources are now included in downloads rather than on a CD. Purchasers of the book also get licensed access to the ABS Consulting website for new and archival information about the field of root cause analysis, articles, examples, charts, forms, etc.